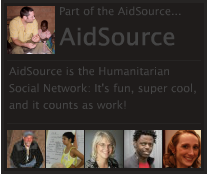 Okay, this is my last post on aid blogging. On the heels of my Who’s Who post and the Aid Blogging Charts, I’m about to go from being known as an aid blogger to that guy who blogs about aid bloggers. Ick. But I found this post today and at first it left me stupefied, then it got me thinking. Here I am all smiley today to have surpassed 1,000 page views in a single day for the first time ever (HT Duncan Green). Then I find this post about bad charity giving published just two days ago that has already been viewed nearly 800,000 times!!! The author, Mark Hill, is not on any of your blogrolls, and probably won’t be any time soon. He writes for CRACKED.com. Some of his other posts include: ‘The 7 Ballsiest Pranks You won’t Believe Actually Worked’ (viewed 2,640,722 times), ‘The 7 Most Irritating Characters From Otherwise Great Movies (viewed 2,113,788 times), and ’16 Real Old-Timey Photographs That Will Give you Nightmares’ (viewed 1,438,858 times). (No I will not hyperlink those.) By the way, warning: his prose is riddled with profanity that is NSFW. 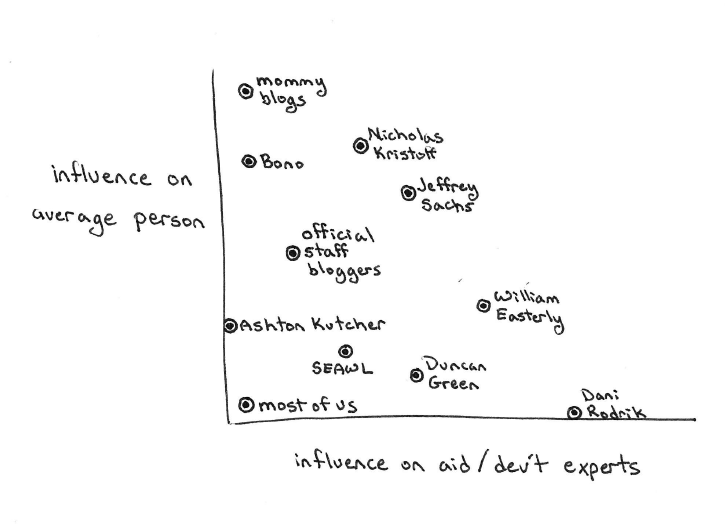 Remember my chart on influence? Well, this guy would be snug up on top of the far left axis (even more snug than Ashton Kurcher) and way off the top of the chart. He’s clearly got an enormous audience of aid non-experts. How much influence that translates into, I’m not sure, especially given that this seems to be his only post on the subject. What is both good and surprising is that his post is actually pretty well researched by today’s standards (i.e. Googling and regurgitating what other people have written online) and not far off the mark to things we might say (with fewer four letter words). He links his reasoning to legitimate people that we know: Tim Odgen, Saundra Schimmelpfennig (yes, of Good Intentions are Not Enough), Brett Keller, Engineers Without Borders, The Guardian, The Economist, Forbes, Aid Watch, even a couple of academic journals. See, not too bad. In fact, Mark Hill is sort of like a brassy potty-mouthed version of Saudra Schimelpfennig, whom he links to at least four times. Well, at least in this post he is; I can’t imagine Saundra writing anything remotely akin to ‘6 Pet Products That Prove Rich People Have Gone Insane’. In a way, this could be a mini case study from The Tipping Point. What Mark Hill has essentially done is used Cracked.com as a virtual Connector and acted like a Salesmen to expose his audience of list-loving, humor-seeking ‘Cracked Friends’ to the information generated by Mavens like Tim and Saundra. The result may be the best kind of influence an aid blogging ‘information specialist’ could ever hope for. Figure 1. Edging Toward A Tipping Point? You see, the danger of being an aid blogger is that half the time you’re just preaching to the choir. Most people, for whatever reason (we’ll just leave that open) simply don’t subscribe to blogs like Good Intentions are Not Enough. But, these same people may very well be the ones who hand over their used underwear to stupid campaigns for knickerless Africans, (btw, bravo to Zimbabwe’s finance minister for following Ghana’s lead today in banning imports of used underwear), or misuse Charity Navigator to rule out charities with anything less than 100% program/0% overhead ratios, or voluntarily airdrop themselves into disaster zones to ‘help however they can’. Let’s play a little game: Which is greater, the number of wrongly-skilled volunteers on the ground within two months of the earthquake in Haiti or the number of people who read an article criticizing volunteering in disaster zones? Which is greater, the number of little dresses made from pillow cases sent to Africa (over a million) or the number of people who could make a reasoned argument why that isn’t super sweet? Which is greater, the number of slacktivists that changed their Facebook status, wore a bracelet, or used a protest Twitter hashtag AND NOTHING ELSE, or the number of people who actually donated a significant sum of cash or time to the same cause? So it is then that a non-specialist can write the most effective aid blog post ever. Key features: a snarky fowl-mouthed humor, a huge audience (that is not already singing in the choir), and a willingness to restate the thinking of actual experts. ← The SOCCKET ball bounces back? How much of this do you think is attributed to the fact that maybe development just needs some new voices? Not saying the Easterlys/Rodriks/professors/field workers are not important, I have a great deal of respect for them and obviously authorities in any field are needed. But the majority of people, in the wider audience you write of, maybe need a more accessible entry point into development issues. I just think that’s maybe where development issues are headed from a media perspective. Of course, I say this as someone who has worked for companies and law firms for most of my career, with a short stint in India as a volunteer for a micro-finance org. I tried to break into development after grad school but many were turned off by my experience, despite the fact that my background is in international trade/business – a field of increasing importance in development. Now, after a long discussion convincing an editor that what I know is related to what he knows, I got a break as a writer. Maybe Hill might be someone who sees the forest and how it borders a road, where people heavily involved in the field can see the ridges on the leaves and the spots on the ladybug. Both are definitely needed and this sounds like a good thing for development efforts. I appreciate your comment, but I’m not comfortable with thinking of Easterly and Rodrik as ‘voices’ in the same way as Mark Hill is a ‘voice’ on international development. 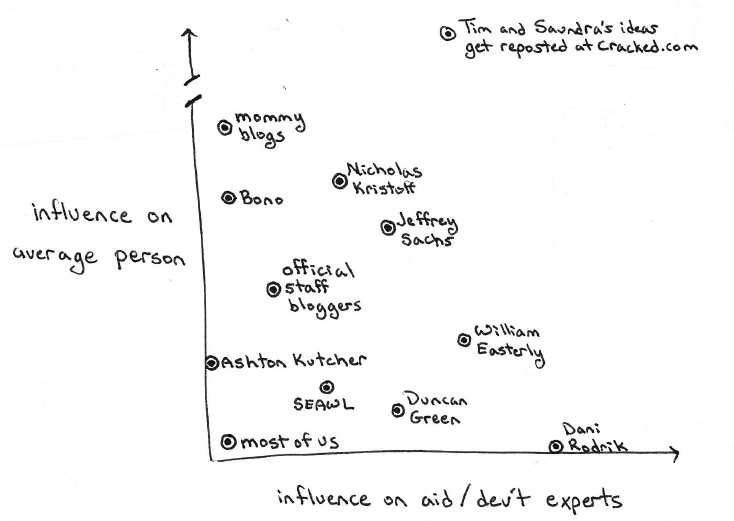 Hill regurgitated decent thinking on charity giving by some pretty influential aid bloggers. Easterly and Rodrik are the kind of people that gave us aid bloggers our education on what makes good development policy. Literally. I was a course assistant for Rodrik at Harvard and met Easterly there on invitation of Lant Pritchett. These are names that actually mean something to us. We haven’t just read their popular books, we’ve read their academic journal articles and debated their lectures. We’ve debated them…and lost. They are generative in our field. Mark Hill, on the other hand, doesn’t generate knowledge. However, he is very good at making a readable broad general interpretation of its application for people not in our field accessible. So, that said, you’re right, most people need an entry point that’s more accessible than say, Rodrik and Rosenzweig’s “Development Economics” or Easterly’s ‘The Elusive Quest for Growth’. But I don’t think its a forest for the tress kind of issue so much as an issue of figuring out how and where and to whom to write when you want to reach a particular audience with a message about good international development from their point of view. They aren’t going to be shaping policy, but they may want to do something. And that something can be good or harmful. Too many of us write for the choir. I’m guilty too. I blush when another popular development blogger ‘likes’ my stuff, but I don’t pay nearly enough attention to people totally outside the field that may be interested enough to read a short article on what makes a good thing to do when Haiti gets demolished by an earthquake or the Sahel dries up. I don’t know, I’m still kind of wrestling with what this means. 800,000 views in three days for a guy who apparently has no expertise in this field whatsoever! It forces one to reconnoiter the whole landscape of writing about development and aid. What is voice and influence? For whom do we write? Why do we write? To make it clear, I would never, and was not in my comment, equating hill with Rodrik/easterly/etc. Im really sorry if that was in any way implied, that wasn’t the intention. My point was just to say, in terms of audience, a new perspective isn’t necessarily a bad thing and should make any stop debating, generating, writing, blogging ideas. No worries, Hugh Grant is as bad for you as tequila:)! I just wanted to clarify. Actually I think you just made the case for aid blogging! 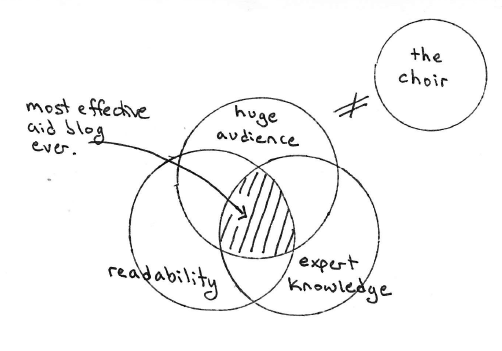 You, me, or someone wiser than us both, maybe writes a good post making an important point. Maybe it gets picked up by a gatekeeper like Saundra. Maybe their thoughts get picked up in turn by the likes of Mark Hill. Lots of maybes in there, but mostly we blog for our own satisfaction (and egos), and the costs are low, so little is lost. The long tail of the internet occasionally makes it into the wider public sphere. We may not be opinion formers, but the blogosphere definitely plays a part in opinion formers own process of opinion forming, and the international aid system is likely no different. Good point. Leave it out there and when a real person has to Google it and write a story about it they’ll find useful information/opinions. Too bad that the “Most Effective Aid Blog” focused on why not to give. Those are the easy arguments. I have talked with numerous people who said that they used to give to charity, but then they heard about this scandal with the Red Cross or that Scandal with Three Cups of Tea. They don’t say, so I switched to X. They just stopped giving. I think that this is our greatest challenge. We need to be better at policing ourselves. Even Good Intentions are not Enough is reluctant to call out bad charities by name and instead encourages donors to do their own research. What if we had the courage to state these are good organizations and these are bad ones. Maybe these arguments and lists would then be picked up by cracked.com or another mainstream blogger and we could actually encourage good donations rather than just discouraging bad ones. Well, at first when I read this post, I was glad I have never written about aid blogging and then I despaired that I blog about aid. One of the hardest things was trying to be original, but apparently that’s not effective anyways. I’m with MJ – let’s just blog and reblog for our own satisfaction and wait for the Mark Hills of the world to find us on Google. Thanks for the (eventual) encouragement to keep going. Most people need an entry point that’s more accessible than say, Rodrik and Rosenzweig’s “Development Economics” or Easterly’s ‘The Elusive Quest for Growth’. But I don’t think its a forest for the tress kind of issue so much as an issue of figuring out how and where and to whom to write when you want to reach a particular audience with a message about good international development from their point of view. They aren’t going to be shaping policy, but they may want to do something. And that something can be good or harmful. Too many of us write for the choir. I’m guilty too. I blush when another popular development blogger ‘likes’ my stuff, but I don’t pay nearly enough attention to people totally outside the field that may be interested enough to read a short article on what makes a good thing to do when Haiti gets demolished by an earthquake or the Sahel dries up.